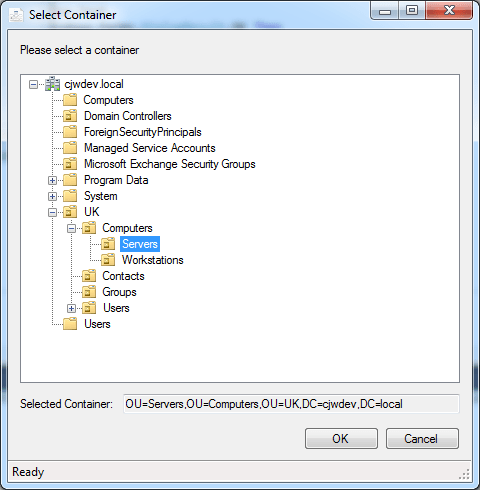 For any .NET developers writing programs that require a user to select a container or OU from Active Directory, I’ve made an easy to use dialog window that will show the domain tree and let the user select a specific container. Is there a way that this app or any of your apps display opened file on a specific server and the username of the person who has it open? Thanks for the quick reply. The intent was to have my app get (on request) the “username” of the person who has a file opened. Not everyone has access to the server so it’s a bit difficult what you suggest. I’ll keep looking but you did point me in the right location. Thanks. Finally I found the tool that I’m looking for a long time. I’m novice on VB. Can you share WPF version of the Active Directory Treeview code if you don’t mine? Thanks for your prompt response. I just sent you an e-mail request. Is there a way to implement Single Sign On with your code. Currently when you open the SelectContainerDialog you have to pass the DomainName, Username, and Password. I can automatically feed the Current logged in user’s Domain and Username with Environment.UserDomain\Environment.Username, but I’m not aware of a way to pass the password. Any ideas? I watched another one of your videos where you use this dialog and it said that if you don’t pass the Domain, Username. and Password, then it uses current users credentials (SSO) automatically. Thanks again for this great bit of code. I am brand new to programming. I am basically learning as I go, by online research and reading books. I have created a program that I use at work, to create a list of random names. So far, I have been taking the list of names and using it to create users in AD with exchange mailboxes through PowerShell scripting. Ideally, I would like my program to be able to connect to AD to create the users/mailboxes and skip the PowerShell script altogether. This article appealed to me because I think it may help with selecting the OU that the users should be created in. But, being new, I am not sure how to add this to my code. I coded in visual studio 2010, with visual basic. Any help/guidance you can give would be greatly appreciated. Unfortunately if you’re working with Exchange then you probably won’t have much choice but to carry on using Powershell. As far as I know there are no pure .NET ways of interacting with Exchange servers. There’s a .NET API that lets you access emails from user’s mailboxes and create calendar items etc but I’ve not seen anything that lets you actually work from a server side and create mailboxes, change server options, etc… which is really annoying considering MS push .NET as their language/framework of choice, and a lot of Exchange is actually written in .NET now, but yet they provide no way for .NET developers to interact with it. Anyway, on to your question about how to use the code. Just download the project files I posted on vbforums and open them – then build the solution (e.g use the Build menu in Visual Studio) and that will compile the code into a DLL in the bin\Release folder within those project files (or bin\Debug if you’ve left the solution in debug build mode). Now you can add a reference to this DLL to your program by opening your program project in Visual Studio, right clicking on your project name on the right hand side, go to Add Reference, browse for the DLL you compiled in the previous steps, and that’s it. Once you’ve done that you can use the code I posted in this blog post to create and show the OU window. Once user selects OU, it shows selected contain Distinguished Name (DN). How can we get the value in behind the scenes? I’m trying to call the “SelectContainerWindow” from other .NET application. Based on user selected OU (and clicks OK), I’m trying to pass the selected value to a variable or other application as parameter. Also it would be nice to see web based version of AD Info and Tidy tools like Manage Engine software. In our organization, we’re looking for web based AD tools. Thank you so much for sharing this work. You are an amazing person. This code is very well written. The year before last i downloaded the ADTreeViewCntl 1.5 and stored it for future work. And today that future is here, and I noticed that you have made new version where it is all in a form. Many methods updated to new improved dot.net notations. Brilliant. Mozart-ish.